Richard Rummel, View of Southern Manhattan, from Kings Views of New York. 1911-1912, p 24. Published by Moses King. 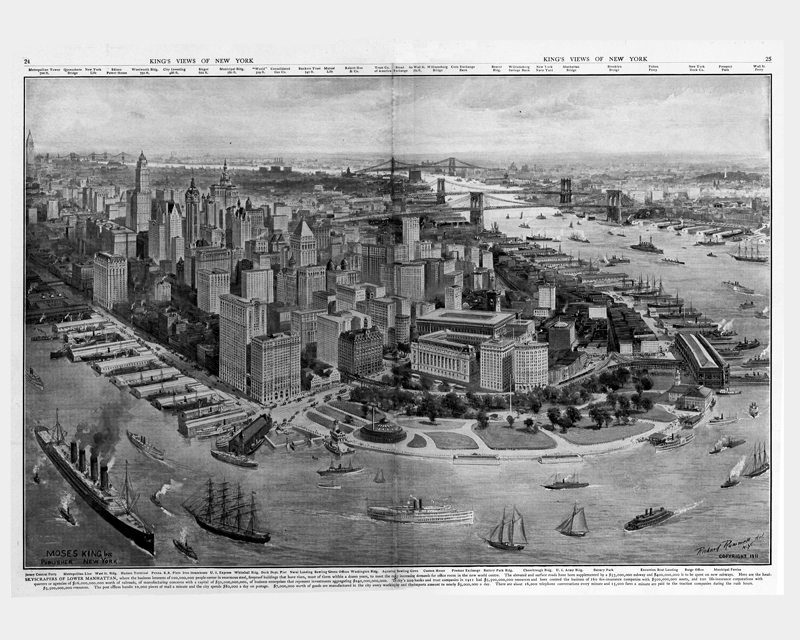 By 1910, high-rise development had spread far beyond the business center of lower Manhattan. While downtown was still the district of finance and home to major corporations, signature skyscrapers such as the Flatiron Building, Times Tower, and the Metropolitan Life Insurance Building dominated new neighborhoods of intensive real estate development. No zoning law yet constrained the shape or height of the new towers, and many rose up 20, 30, and 40 stories straight above the sidewalks. A competition for the title of "world's tallest office building" was passed in quick succession from the 612-foot Singer Building in 1907, to the 700-foot Metropolitan Life Insurance Building in 1909. The Woolworth Building would stretch nearly 100 feet higher. New York in 1913 could be called unwittingly modern. If "modern" is considered a condition, rather than a style, then Manhattan was surely the most modern place on earth: its soaring skyscrapers, hurtling subways, and teeming crowds made it so. Indeed, in the 1910s, New York was the world's only true skyscraper city, for Chicago had restricted its high-rises to a maximum 260 feet. Stylistically, though, New York's high-rise architecture was conservative, disguising its towers as medieval campaniles, French chateaux, or classical cenotaphs. Often called "Beaux Arts" after the Parisian Ecole des Beaux Arts where many of New York's prominent architects were schooled, the cultured architectural aesthetics of the day emphasized historical ornament, and generally lots of it. The skyscrapers pictured on this wall illustrate the context of high-rise development and design among the contemporaries of the Woolworth Building. The images and text identify the two major types-the slender tower and the big block with light courts-that characterized the laissez-faire era before 1916, when the zoning law would give new forms to setback skyscrapers.